Another season means another reason to have fun! While summer had people depending on air conditioners and cooling equipment, autumn is generally colder. 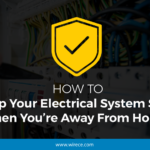 Expect to switch the use of appliances and electrical equipment in this upcoming season, which means you have to look into a new set of electrical safety checks. Don’t fall into the trap of disregarding electrical safety during the fall season! Check out our tips to keep your autumn as safe and enjoyable as possible. You probably won’t be using trimmers and lawn mowers as often as last summer, and so it’s good practice to put them in their proper storage locations. Leaving them exposed to the elements may degrade these tools and increase the risk of damage. Likewise, it’s time to take out your leaf blower and snow clearing equipment. Have a quick check on the tools and their respective wires for signs of damage or malfunction. Don’t use them if you see some issues and have them either repaired or replaced before fall comes. Summer may have been brutal for your electrical system, especially as you use cooling equipment more often. This is the best time as ever to check the integrity of your extension cords. Immediately replace any cords with signs of wear and tear. Don’t let fallen leaves collect and cover your outdoor electricals such as lighting installations or power outlets. Failing to clear them away may invite moisture into your electrical system, which will definitely increase the risk of short circuits. Because the fall season is wetter than summer, make sure that your power sockets are protected from moisture. You may install a screw cover or replace it with a GFCI outlet for better protection. Because fall has generally less daylight hours than summer, expect to use your indoor lighting more frequently. Having said that, check the status of your existing light bulbs. Are they still working well or are they showing signs of becoming busted? It’s also a good idea to stock up on replacement bulbs because the higher frequency of use will definitely shorten the life of your existing lamps. Just be sure that what you’re buying is the correct wattage and compatibility with the lighting receptacle. We at Wire Craft Electric are concerned about your safety. If you think there are some electrical issues in your home as fall arrives, give us a call as soon as possible. Our skilled professional electrical staff will attend to your needs pronto!